around the one thing no one can compete with you, and that is You. 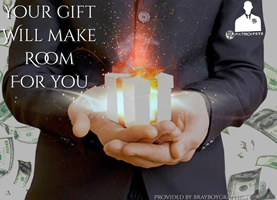 Gift University connects you with people on the same quest you are on and those who have walked that journey successfully. Promoting, selling and marketing is the least liked, but the most important part of financial success. Who better to promote, sell and market you than you, Gift University is a good place to start the process. We will show you how. There are an estimated 7 billion people in the world, but the key is not to reach all 7 billion. The key is reaching those people who are uniquely made to receive your product, your message. We help you find that audience and engage them.